Silence is an examination of keeping the faith when the courage of your convictions is tested. Just how strong is the human spirit when the only voice you hear is that of your inner critic? All of this is examined in Silence directed and co-written by Martin Scorcese. Firstly if you’re hoping for a Scorsese film — that of yesteryear – Raging Bull, even that with Leonardo Di Caprio, The Departed – that was before but this is now a very different Martin Scorsese. 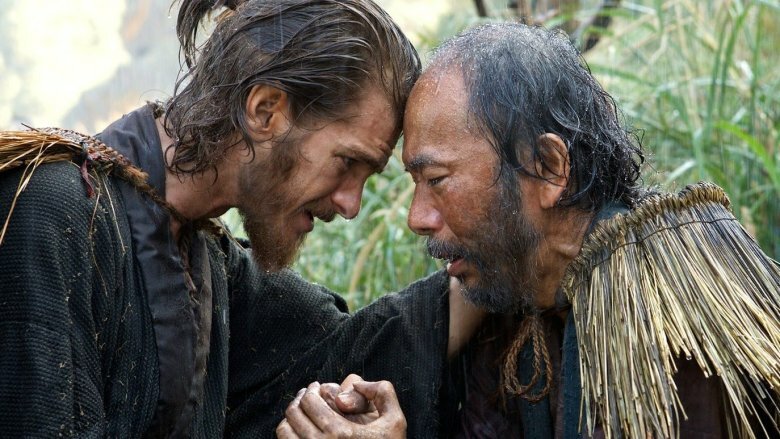 Silence is based on a bestselling book and dedicated to all those Christians and Portuguese Priests slaughtered during feudal Japan. The roles of three priests at different stages of their faith are played by Adam Driver, Andrew Garfield and Liam Neeson. We only see Liam Neeson briefly and then he’s gone to return much later in the film. What we are left with is a two hour mediation on faith and a flimsy psychoanalysis of the Japanese psyche and humanity et al. What’s the film really about? An overtly political film about having the courage of your convictions and faith even in a nihilistic swamp that America’s become culminating in the election of Trump! Then there is the curious case of Andrew Garfield who takes on the main role in this film. This is the first of two films in which he faces hellfire and wrestles with the courage of conviction, the other is Hacksaw Ridge which is released later this month. He does an admirable job in both although I preferred his role in Hacksaw Ridge. This meditation on faith and humanity left me exhausted and slightly delirious for one blessed moment I imagined I saw Richard Chamberlain in Shogun but alas the Silence is maddening. Well, three quarters of the cinema was full when I saw it at a public screening but then again the choice was limited on New Year’s Day. Then there are Scorsese fans although be warned this is an altogether different Scorsese, one that I don’t recognise or even really want to ever give another 3 hours of my time to. Yes it is 3 HOURS long! If feudal Japanese history mixed with religious iconography gets your juices flowing, then welcome to Silence and you may just have a silent auditorium to watch it in. Silence was released across cinemas in the UK on 1 January 2017. Next Post Oscars 2017: Dismissive or Diverse? I think I’ll give that one a miss then!